Over the last 10 years, gold bulls have had a fantastic run as gold rose more than 475% to its August 2011 highs. Even after the recent collapse in gold prices the metal is still up more than 350% in the last decade; the simple strategy of “buy the dip” has yielded enormous profits. Gold bulls have been able to make gains for years by merely buying gold whenever the price dropped as the next rally would result in new highs before a great deal of time had passed. This however raises the question of “what happens when gold does not make new highs?” The answer is that those who have been employing this strategy lose money; gold dips and the perma-bulls buy, gold dips again so the perma-bulls buy again, gold continues on a downward trend and the once profitable strategy of “buy the dip” soon eats away at the profits that it once generated. The difference between being bullish and a being a perma-bull is that a perma-bull will always buy the dip. This difference makes being a perma-bull a reckless, dangerous, and unprofessional trading strategy, and the result is potentially devastating to a portfolio. We have no issue with one using a bullish or bearish strategy, provided that it comes with a plan B in case they are wrong. The problem with being a perma-bull is that they do not have a plan B or a contingency plan, and believe that they cannot be wrong. Over the bull run of the last decade we have seen numerous commentators state that gold will rally to $2000, $5000, or $23,647.17 per ounce, but we have not had these claims accompanied with an exit strategy if they were wrong. Mention of a price fall would usually be followed by a “buy the dips” statement. This sort of strategy is fine as long as a stop were in place, a pre-determined point at which market action discredits the original thinking and one exits the position. However, if you are buying gold to stash under the mattress or in the basement next to the canned food and guns in case of Armageddon, then this will likely not apply to you. In this article we are of course only referring to professional investment and trading operations. To gold bugs we therefore pose the question, at what price level are you going to stop out of your losing positions? The answer to which should only be numerical, such as “We will exit all positions if gold trades below $1200” or “We will reduce our exposure by 50% at $1300 and to zero at $1000”. What matters is that one has an exit strategy in place; there must be a defined level where the market action discredits one’s original stance and they close their positions to prevent catastrophic losses. Simply stating something along the lines of “gold is going to $23,467.17, so I won’t have to stop out” is a foolish move, and as the saying goes “a fool and his money are soon parted”. The first rule of trading is to manage risk; running a position without a stop is not managing risk. With this in mind we do not take a position without a pre-determined stop level in mind. Last year we opened many bullish positions on fold as employment data deteriorated. We believed that the Fed would launch QE3 to aid economic recovery, and as a result gold would rally. However, we took these positions with the knowledge that we may be wrong, and therefore put in place an exit strategy; if gold failed to break $1800 as a result of QE3 then our original view would be wrong and we should exit our long positions and re-evaluate. Gold failed to break $1800; consequently we exited our positions as per our strategy, taking the loss in December. As we reassessed the market we took some time on the side lines with most of our portfolio in cash. We concluded that there was a high chance that the bull market for gold was over and that gold prices held significant downside. 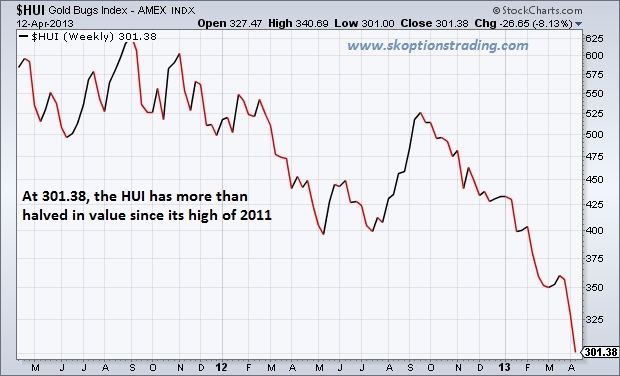 Thus our trading strategy for 2013 has been bearish, taking gold from the short side and to target mining stocks. We had set a target of 300 for the HUI, which was achieved last Friday. So far the change in strategy has served us well; our portfolio is up over 28% on the year whilst even some of the most highly regarded names in the industry are down by more than 30% already. Our overall view that the gold bull market is well and truly over is made clear by the fact that the gold mining sector, as measured by the HUI, has halved in value. This means that gold stocks would have to more than double to return to those levels, given their performance in recent times, we find this highly unlikely. We do not write this article to persuade other readers to our point of view on the market, but simply to stress that one must always be humble in the face of the markets. One must admit that there is a possibility that they will be wrong from time to time, and should therefore have a contingency plan for such situations. It is vital that professional investors and traders have a plan B and know when to pull out of a position. Despite 10 years of good times, we must accept that the gold market is currently changing, and we should therefore adjust our views and portfolios accordingly.